I’m glad that you were at least able to get her in time before someone else came along that wouldnt have been so nice or even the trash company actually threw the poor bun away along with the hamster! She is a beautiful bunny and I’m hoping that she will find her forever home very very soon. have you found a home for her ? She has been fostered for adoption to see if she will bound with their rabbit. Hopefully the bonding will be successful and she will have a new home and a new bunny companion. 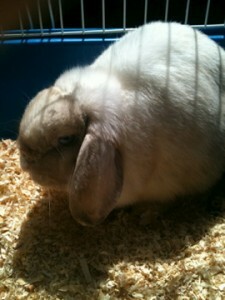 she is so cute i have bunny and she is an minilop bunny and she has big feet and they are gray. well i hope she finds a good home i wish i could take her off your hands for you but my mom will not let me because i am only 7.